This article was published in the matchday programme for the FA Cup tie between Clapton and Stanway Rovers on 15th August 2015.
t has been many years since Clapton have been able to boast any success in the FA Cup. The win at Stanway in 2013 was our only success in the competition in the last ten years. 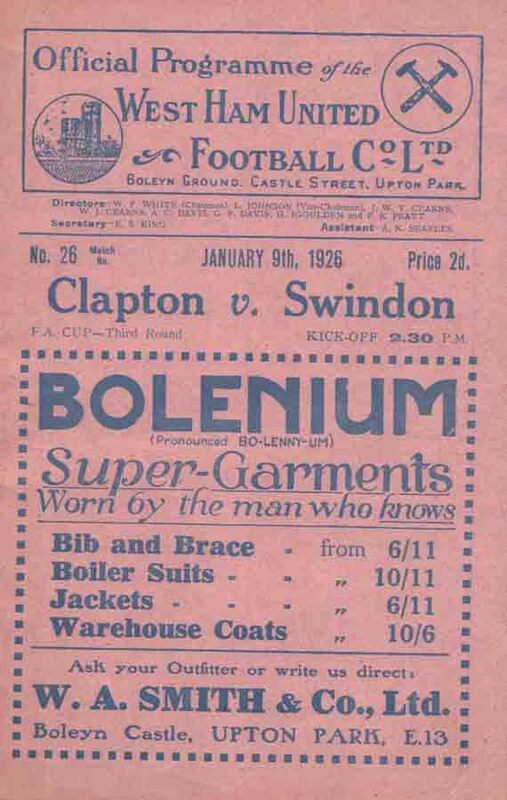 The last time Clapton went beyond the 1st Qualifying round was 20 years ago, and our last match in the competition proper was a first round replay in 1957 away at Queens Park Rangers when we lost 3-1. (Scorer – R. Brewster) In the Rangers team that day were England goalkeeper Ron Springett and former Orient manager George Petchey. However, a recent tweet from @FACupFactfile cheered me up this week as, of all the teams in today’s extra preliminary round, we have the second best record, next to amateur giants, Bishop Auckland. If all else fails, look to your history! However, one of the more interesting episodes happened in 1985/86 when Clapton beat Leytonstone-Ilford 3-2 in the Preliminary Round tie (Scorers – Billy Partridge, Michael Collins and Chris Sharples). The game had been played at Leytonstone’s Granleigh Road because, in the wake of the Taylor Report, the GLC had closed the Dog on Safety issues. It was the first game of the season and some players were reluctant to sign Isthmian League forms given the inevitable travelling, should the requisite repairs not be carried out. Unfortunately, a rule of the FA Cup was that players had to be signed on with their club for at least seven days before they could play in the cup. After the game it was mentioned, in a Committee Room conversation, that the Clapton players had only just signed League forms, following which, the boys from the badlands of E11 raised an objection and Clapton were disqualified. Some history we would prefer to forget. Previous Previous post: Are Clapton FC, Posh FC ?